The world cannot believe Vladimir Putin's statement he has ordered Russian soldiers withdrawn from Ukraine's borders with chaos still reigning in some East Ukraine cities. But yesterday was Putin's day of victory both in Ukraine and Syria and the only way he could has to declare victory is tell the world he no longer requires his soldiers in Ukraine's borders, because the reason he has them there has been achieved. The Russian separatists have taken control of their destiny, and the world watches how Ukraine forces withdraw in humility after riotous and agonizing encounter with separatists. Secondly, rebels were seen boarding buses from Hom based on a truce with Basir Al-Assad's government, and the media says that signifies a victory for troubled al-Assad and indirectly to his friends and humanity, while observers pray that the killings and displacement of Syrians will come to an end. Ukraine is a recent development the world has been pray does not go the way of Syria. Putin certainly believes he has won on two fronts and withdrawing his soldiers from the Ukraine's borders shows a man in control of his decisions and will not waste Russia's resources than required. 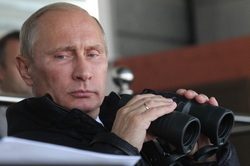 Developments in Syria and Ukraine buoy Putin's reason to go back to the drawing board and see how he has fared.